Quentin Tarantino’s The Hateful Eight has taken an unusual path to production – even by Tarantino’s outside-the-box standards. For a while, this was going to be his follow-up to the Oscar-winning Django Unchained, keeping the writer-director in spaghetti Western mode. Then, as you might recall, the script leaked… and all hell broke loose. But the project appears to be back on track, and the poster above suggests a 2015 release date is in the cards. 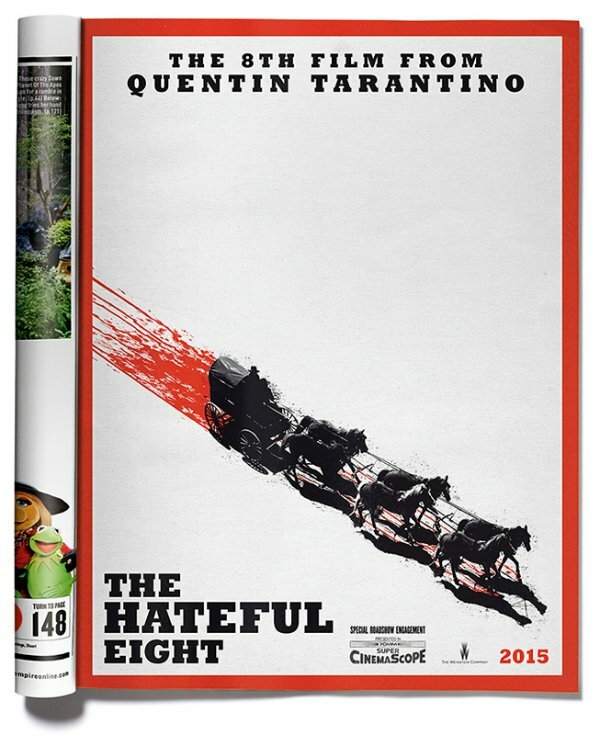 Empire shares the image above, clarifying that Quentin Tarantino’s eighth picture will be the revenge epic The Hateful Eight, with a crimson-colored 2015 in the corner to get fans’ hopes up. The poster teases a "Special Roadshow Engagement" in 70MM Super CinemaScope, which is twice the film stock ratio of a traditional 35MM and was utilized – in the pre-IMAX era – for larger-than-life epics such as Ben-Hur, Cleopatra and Lawrence of Arabia. Paul Thomas Anderson was the last American director to play with the format in 2012 for The Master. It sounds like Tarantino is going to paint on a massive canvas for this bloody soap opera. What else do we know about The Hateful Eight? A lot, actually, thanks to all of the details that emerged as Quentin Tarantino tried to sue the Web site Gawker for pointing readers to a leaked copy of the screenplay. (The lawsuit has since been dismissed.) Kurt Russell, a member of the cast, recently revealed that The Hateful Eight would start filming early next year, meaning a late-year release date is probable. Could it open in December, like Django Unchained, and contend for awards? The Hateful Eight sounds like it was going to be a return to the roots of Reservoir Dogs, limiting its locations to two small spaces and focusing on character and dialogue in a way that Tarantino hasn’t in years. Details claim that the story starts with a bounty hunter arriving in a town called Red Rock to drop off a prisoner and claim a reward. But the director has said that the script remains a work in progress, and I expect a lot of the details we already know to change because of the leak. Tarantino has said that the ending he had in the leaked script will have to change before he films anything. We know for certain that Kurt Russell (Death Proof) will be part of Quentin Tarantino’s The Hateful Eight. And other names – from Samuel L. Jackson, Tim Roth, Bruce Dern and Walton Goggins to James Parks, Michael Madsen and James Remar – have been attached, but I don’t believe have been confirmed. If the poster is the first step toward legitimizing Tarantino’s next picture, expect several more details to start falling into place as we approach next year.